Real Madrid registered a comprehensive victory over their cross-city rivals Atletico Madrid in the most exciting game of La Liga this week. With this win, Solari's men climbed second in the La Liga table, five-points behind FC Barcelona. Real entered the game high on confidence after securing a 1-1 draw over their long-term rivals, FC Barcelona. Atletico, on the other hand, had suffered a 1-0 loss in their previous La Liga fixture against Real Betis. Solari made two changes in the starting XI from their last fixture against Barcelona. Marcelo was replaced by Sergio Reguilon on the left and Casimiro starting ahead of Marcos Llorente in a defensive midfield role. Atletico Madrid were all over their rivals in the opening minutes of the game but failed to find the net. However, Real Madrid scored the opening goal of the game through an astonishing bicycle kick by Casemiro. Antoine Griezmann levelled the score for the home side after he calmly slotted the ball through Courtois' legs with 25 minutes on the clock. 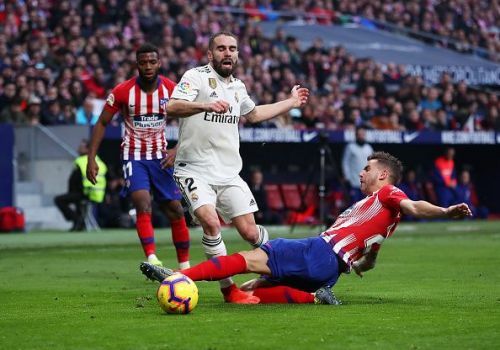 Vinicius Junior made an amazing run from the half line, only to be fouled by the Atletico defender on the edge of the box. VAR came into action over the doubts whether the Brazilian was fouled outside or inside of the box. Replays showed that he was a fouled inside the box and the referee's decision stood. Ramos took the penalty and hit a powerful shot in the bottom-left corner which was out of reach for Atletico keeper Jan Oblak. Bale scored the third goal with 15 minutes to spare and put the game to bed. It was the Welshman's 100th goal for the thirteen-time Champions League winners. Real Madrid will look to continue their impressive form when they travel to Johan Cruijff Arena to face Ajax in the round of 16 clash in the Champions League. Atletico Madrid face Rayo Vallecano next week before facing Serie A giants Juventus in the Champions League. Courtois celebrated the two goals scored against Atletico Madrid. Morata actually celebrated his disallowed goal. No love in this #AtletiRealMadrid derby😭. VAR = Video Assisting Real Madrid?